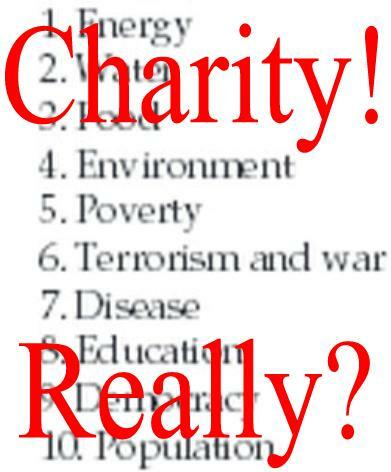 Charity Is the Best We Have to Offer In the Face of Our Energy Challenge? Kevin Bullis posed a telling, question in an MIT Technology Review article Should Energy Startups Be Funded as Charities? In Richard Smalley’s presentation, Our Energy Challenge (And Opportunity} he stated: “Energy is not just “any old issue.” Most people, in fact, understand its importance very well. When I have given talks on this subject before, I have often asked people in the audience to name the most critical problems we will have to confront as we go through this century. In every case, after a bit of discussion, the audiences have agreed that energy is the single most important issue we face. Why is energy always preeminent? When we look at a prioritized list of the top 10 problems, with energy at the top, we can see how energy is the key to solving all of the rest of the problems. When Smalley spoke of energy he was talking about “new oil”—a basis for energy prosperity in the 21st century that is as enabling as oil and gas have been for the past century. It is too risky for today’s ordinary investor to take on the challenge of discovering and producing this enabling energy? In a previous post I pointed out how an old family friend wildcatted nineteen straight dry holes in the early fifties, in Alberta, before finally meeting with success and how he had been able to do this because his generation were more than eager to take on the challenges and more importantly were hungry for the opportunities. I also tried to make the point that the challenges faced in Alberta’s oil patch 60 odd years ago weren’t that far removed from what today’s renewable energy wildcatter is up against. In this day and age most of the items on Smalley’s list are considered government responsibilities. Take the environment; in 2012 natural disasters combined to produce economic losses totalling USD 200 billion. Considering only about 36 percent of these losses were insured the balance of 128 billion was underwritten by government for a total of about $18 for every person on the planet. Considering half those people live on less than $2.50 a day that represents a full week of their labour. It is also that half that bears the brunt of climate related disasters and though effectively wards of the United Nations in terms of the issue, their protector has done little besides produce huge annual spectacles to defend their interests. The governments of the developed nations are also mostly on the verge of insolvency and thus are limited in what they are able to accomplish even if they had the will to tackle the issue, which for the most part they do not considering their cozy relationships with existing energy industries that are sanguine with the status quo. Debt has been another tried and true avenue for economic development but since nearly blowing up the global economy five years ago, the world’s bankers have withdrawn behind a wall of vastly collateralized loans even as they leverage themselves to the hilt with USD 606 trillion in over-the-counter notional derivatives, which by definition are exceedingly speculative and in the real world have about as much utility as Monopoly money. Earlier this year ING Bank showed total world indebtedness, including all parts of the public and private sectors, is USD 223.3 trillion or 313 per cent of the global GDP yet little of that capital has found its way into efforts to solve the world’s oil replacement problem and by extension its next top nine most pressing concerns. Is it any wonder then that credit default swaps, which are a bet against loan defaults or other credit events, are one of the most popular financial derivatives? Equity is the main avenue by which investors have historically sought to finance innovation and capitalize on new opportunities. Today’s investor however is more likely to be of the Warren Buffett mould. Value investors like Mr. Buffett seek to buy stocks at less than intrinsic value, which is determined on the basis of past performance that was built on the back of the company’s founders and financed in the main by individuals willing to take an initial risk. Innovators have little to no track record on which to base such valuations and thus the pool of capital, which is ever increasing as the small investor is pushed out, represented by the value investor is generally foreclosed to them because for the value investor the market is a balance sheet beauty contest as opposed to instrument of the kind of destructive capitalism necessary to meet the energy challenge. Mr. Buffett and other high wealth individuals have pledged to dedicate the majority of their wealth ultimately to philanthropy but this again is charity and far less than our children deserve and rightfully expect and in most cases that capital won’t be enough or come into play soon enough to make the difference needed. It would be far more magnanimous were these people to marshal their capital, skills and expertise in support of solutions to the problems of today, which compound daily. In its 2009 World Energy Outlook, the International Energy Agency announced that every year of delayed action to address climate change will add $500 Billion to the price tag of saving the planet. According to Wikipedia, as of April 28, 2011, 69 billionaires had joined the Giving Pledge campaign and pledged to give 50% or more of their wealth to charity. An estimate of the contribution promised by the first 40 donors, based on their aggregate wealth as at August 2010, was $125 billion. Whereas fifty years ago most investors made their own stock picks, today they are more likely to be enrolled in mutual funds or other pools, such as pension funds that are operated by conservative investment managers, uninterested in impact investing. Sallie Krawcheck claims in an article Big Idea 2014: Investing Will Completely Change, that the above situation is about to change. Because, she says, baby boomers are about to retire and as they do they will acquire the opportunity to express their values – social, environmental or political – through their investment dollars. Venture capitalists over the past decade have tried to fill the energy startup void but as Mr. Bullis explains this source has dried up. Crowdfunding is another potential avenue for funding new energy startups but current efforts are more a cross between the United Fund and television’s shopping channel than vehicles through which impact investors can legitimately seek to do well by doing good. Crowdfunding is however exactly what is needed because it is our children’s future at risk and no one has more interest in safeguarding that future than the individual but with that funding should come the potential for creating a financial legacy as well. Crowdfunding with safeguards is also one of the best ways to determine wherein the social license for the various energy forms resides. Equity-based crowdfunding models are currently legal in Australia, UK, the Netherlands, France, Belgium, Germany and once this trend becomes more widespread the rising of the oceans may actually begin to slow and our planet make actually begin to heal. Perhaps 2014 will be the year. Jim, the idea of funding energy startups as charities as opposed to subsidies or research grants seems a bit odd. What we’re doing, in essence, is using the government’s money (to the extent donations reduce tax revenues), but handing the decision over to individuals. I’m not inclined to entrust the average citizen with spending government funding which belongs to all of us. Equity crowdfunding, of course, is not really a new concept but venture capital investment with a 21st century twist. I don’t see either crowdfunding or traditional philanthropy to provide enough resources to jump start a clean energy economy. While I disagree with much of current policy coming from Washington, the solution lies in a government which can shed some influence-peddling and make decisions based on the best science available. I see this Tax Deductable Crowd Funding of High Risk High Reward R&D as a legitimate and useful method to get Innovative alternative methods of energy production funded and certified without the constraints and unpredictable allocation of funding through government grant programs. While ARPA-e has a fine Energy Innovation Summit program and the various DOE programs offer funding for pre determined approaches to meeting our energy and transportation needs; too often these programs have also suffered the constraints imposed by National Budget Delays occasioned by frequent disagreements in the US Senate and Congress that result in Budget Sequestrations accross all Government Agencies and programs. This private funding of High Risk High Reward R&D can prove to be quite an asset in an Entrerprenurial and Innovative Bootstrapping environment where public funding is unpredicrable to say the least. Thank you Jim. I believe this conflict is actually Global in nature and has been for some time now. All Undeveloped Nations through the gamut to Developed Nations have gone this way. We all pay the price for this in the long run as we all inhabit the same planet. Whether you refer to it as “business continuity”, “disaster recovery” or “change management”, resilience is a primary concern for businesses — particularly when it comes to conservation and sustainability. The energy landscape shifts day by day,..
[caption id="attachment_2433264" align="aligncenter" width="500"] Mark van Baal addresses Shell shareholders. [/caption] The climate resolution which will be voted on at the upcoming Shell annual shareholdings meeting on 22 May, is not about Shell..